SVF NORTH 2019 - VERY LIMITED NUMBER OF NEW CAMPING SITE C TICKETS AVAILABLE AND LAST FEW DAY TICKETS LEFT. PLEASE ORDER CAREFULLY TO MAKE SURE YOU HAVE CHOSEN YOUR PREFERRED CAMP SITE - A & B ARE SOLD OUT AND LIMITED NUMBER OF SITE C AVAILABLE. PLEASE INCLUDE ALL UNDER 16s TICKETS YOU REQUIRE (2 MAXIMUM, PER ADULT), AS THEY CANNOT BE ORDERED SEPARATELY AT A LATER DATE. IF CAMPING WITH A MOTORHOME/CARAVAN/CAMPER VAN/LIVE-IN VEHICLE, PLEASE REMEMBER TO ORDER THE RELEVANT VEHICLE PERMIT. Please click the Shopping Basket below when you have chosen your tickets, to complete your order. EVENT TICKETS can be purchased with or without camping for either Friday, Saturday or Weekend (non-camping) or Full Weekend only (camping). They are broken into two age brackets, adults 16+ or Under 16’s for those aged 15 or younger at the time of the festival. Please note: Tickets will be posted out by registered post, so will need a signature on receipt to guarantee safe delivery, within 28 days of ordering. CAMPING TICKETS are charged per person and include free vehicle parking in the car parking section. For safety reasons, vehicles cannot park next to tents, but will be located in the secure parking section immediately next to the tents' camping area. You will be able to unload your camping gear near your pitch, on arrival, and will be given assistance from our team of helpers with trolleys. Motorhomes/caravans/camper vans/live-in vehicles will be located in their own section and there will be a dedicated section for scooters and tents. Camp Site C tickets just released on sale - very limited numbers. Camping tickets now full weekend only so sufficient pitch spaces can be reserved for all campers. When booking camping tickets please note: If you are bringing a Motorhome/Caravan/Camper Van/Live-in Vehicle don't forget to order your permit below, so your camping space can be reserved. If you are bringing a scooter and tent please confirm in the Special Instructions box when ordering and you will be sent a permit for the secure scooter camping section. A limited number of Camping tickets for Camp Site C will be on sale here from 6pm on Monday 4th February. If you’re bringing a Motorhome, Caravan, Camper Van or other type of live-in vehicle (a vehicle you will be camping in), please order your permit here. Due to space restrictions there are limited numbers available and there is a small £10 surcharge for the Castle Park Main Camp Site A permit. Please note, any camping vehicle without a permit on arrival will be refused access to the site as all spaces are reserved in advance with a permit order. All prices include booking fee. Payments processed securely by PayPal. You do NOT need to have a PayPal account to pay by credit/debit card, just select the "Don't have a PayPal account" option at the bottom right when you get to the PayPal checkout panel. All orders subject to a £1.80 secure registered postage charge (tickets need signing for upon delivery). Tickets can be purchased in person from September from The Everyday Cafe, 26 Front Street, Stanhope, DL13 2TS. SVF V1 2018 T- shirt pre-orders are now finished. 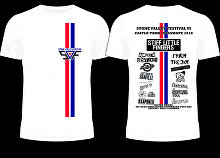 T shirts can be bought from the t shirt stall on the festival weekend. All T-shirt orders already made will be held at the t shirt stall at the festival, for collection in your name.